Not only does she have the chops, but she is an excellent raconteur. Don’t miss an evening with Liza Pulman, as I am sure Barbra Streisand would be very proud of her performance. During Liza Pulman Sings Streisand she completely draws the audience in as she chats in between songs, with witty asides and anecdotes. Her voice powerfully soars through ballads with the backing of the superb six-piece band which compliments the rainbow of colours in her voice. Her diction is always clear and her style is at times operatic, which makes sense as she informed us she trained for 6 years as an opera singer. Her voice ranges from the deep feeling in your gut to the gentle lightness that makes the hairs on the back of your neck stand up. Pulman is the complete package, a real entertainer whose voice is sublime and comic timing is on point. As Pulman herself says she is not an impersonator she is celebrating Streisand and her vocal bravery. My favourites included: “Don’t Rain on My Parade, ” and “Evergreen” which was written by Streisand and sung by Pulman with delicacy and grace. “Down With Love” had the perfect mix going from a slow tempo to up-tempo jazz, it was a very sassy yet elegant rendition. I loved Pulman’s “The Way We Were” especially her sustained note at the end. “ You Don’t Bring Me Flowers” was so poignant and heartfelt. Interspersed between her marvellous singing, Pulman gifted us wonderful stories about Streisand’s journey through life and as a performer, for example, did you know that she did her first recording at the age of 13 when her mother recorded a song? It was “My Man” which was recorded by many great singers before her including Billie Holiday. Did you know Streisand only performed in 2 Broadway musicals? During the time spent with Pulman we are treated to a proper cabaret concert; celebrating Streisand’s songs and providing insights into her life and Pulman’s personality. She makes us feel like there is a personal connection with her. What a classy, smart and funny singer, she also has the most glamorous clothes. 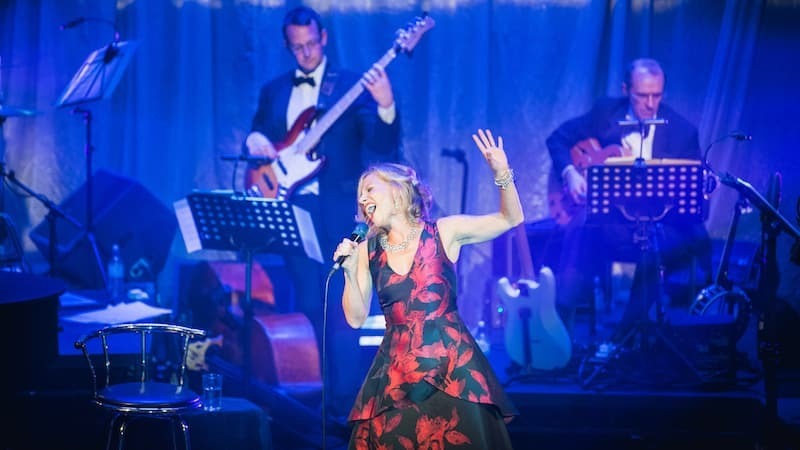 Liza Pulman Sings Streisand is only running Mondays through 15 April at the Lyric Theatre.